HALLIE EPHRON: I try not to Google myself. Really I do. I've learned the hard way that there's plenty of stuff "out there" that I do not need to step in. But between Night Night, Sleep Tight coming out in March and a story "Photoplay" with the same characters about to come out, I succumbed to the Google's siren song. 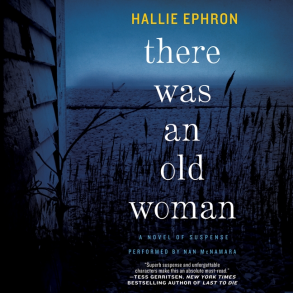 I discovered, among other things, that someone is selling an audio version of my last book, There Was an Old Woman. Audio?? Having a book made into an audiobook is old hat for many authors, but for me it's been an unfulfilled dream. At first I assumed it wasn't real. You'd order your audiobook and get a paperback, or maybe a CD packet with empty slots. Or it would be pirated. But upon inspection, it turned out that the publisher was Harper Audio, and the CDs were on sale at Amazon, B&N, as well as the publisher's web site. The narrator Nan McNamara is a real, super-talented actress and voiceover artist. She also voiced one of my all-time favorites, the classic The Woman in White by Wilkie Collins. She wrote back, very apologetic. I love my editor. She immediately sent copies and I had a listen. There is something weird and wonderful about hearing your words read by aloud someone else. And something delicious about a genuinely auspicious surprise. But the best was yet to come. At around the time I found out I had an audiobook, There Was an Old Woman hit the New York Times best seller list. It happened the week before Christmas when, as we all know, no one in publishing goes to the office or looks at email. And like the proverbial tree falling in the forest, I never heard a rumble. It wasn't until a week into January that I found out. My phone rang late in the afternoon. Caller ID said it was my editor. She never calls, so I knew right away it was either really bad news or really good news. There is no news better than: "Your book was on the New York Times best seller list," and "There's time to get it on the cover of your new book!" So a month ago, I didn't know I'd ever be able to say this, but here goes! For one randomly drawn commenter, today I'm giving away an audiobook of the New York Times best seller There Was an Old Woman! So I hope you all will forgive me for succumbing today to blatant self promotion, but can I just add: Whoo whoo! blatant self promotion? Nonsense . . . it's all so well-deserved and it's great to read about it here. And all of it is really such exciting news, making the New York Times bestseller list and having an audio book [which gives all of us even more to enjoy]. Nothing to forgive! You're just sharing your exciting news with your friends, and there's nothing wrong with that. And now we can party with you, although it's a little early for champagne, even for me. ;^) But I will hoist a glass to you later on, and dream of my own books getting into audio, too. *When your ideas suddenly come together into something you can happily propose. *When you are offered a contract for it. *When the contract is signed. *Each time part of it actually works when you are writing it. *When you finish it and send it off. *When your editor likes it. *Each time you send back the edited/proofed sheets/e-file. *When you first see the cover. *When the first copies come. *When you see it on store shelves. *When it gets a good review. *When people show up for a signing. *When the numbers are good. *When people tell you they love it. *When it wins a prize. *When it makes a list. *Each time a different edition-- audio or translation, etc., is negotiated or comes out. *And-- though it's not something I've experienced, when it's optioned, when the option gets picked up, and all the steps after that. Having had an alternate career, I can vouch for the fact that one can only milk a court case for perhaps three elations. Writing is so much more satisfying. Thanks, Joan and Edith! Hoisting a glass back... later today. That moment when you know there will be a NEXT book. Great list, Ellen -- and I'd add all those moments when you get shot down. So with every rejection, hoist a glass, too! Because what you're doing is hard and putting yourself out there takes courage, and because for most of us rejection is part of the journey. So celebrate! FChurch, you got THAT right. First reaction: It wasn't a fluke! Next: Panic! What made me think I knew how to do this. I've been there. Go ahead and enjoy it. You deserve it! Oh, Hallie - Such great news!! Congratulations! And, please don't apologize for sharing such great news, this is happy news and we're thrilled to be able to share your joy. Congratulations, Hallie! Well deserved. I loved OLD WOMAN. What a great way to start a new year. Congratulations! Great way to start out the new year. So happy you shared the news. Congratulations. I love that book! Wow. Sometimes the planets really do line up. Great news. You've worked long and hard and greatly deserve this. Congratulations and may this only be the start or your glory days. Go Hallie! Hallie, congrats again on the NYT list! And on the audio book! Aren't they fun? And readers are in for a real treat with Night, Night, Sleep Tight! Thanks, guys! I so love this blog... like Susan, ever grateful to the Reds and readers. Yay, Hallie! It's well deserved. I usually get the audio version after I've already read the book. As you said, the audio is a different experience--I discover new dimensions to a story when I hear the book interpreted by a good actor or actress. Terrific news for a wonderful novel. Congratulations on both fronts. Woo hoo is right! Congrats! You deserve to be happy and proud. I am eagerly awaiting the release of Night Night, Sleep Tight. I loved There Was An Old Woman. It would be awesome to have the audiobook. So excited about There Was an Old Woman coming out as an audiobook. And that book is on the NYT bestseller list? So happy for you. And for us, your readers. We expect BPS here. That's kind of why we hang around Jungle Reds. We need info. Y'know? Like that paranoia when the phone rings in the middle of the night. Can it possibly be good news? I would never consider sharing your wonderful news with us as blatant self-promotion, Hallie. What exciting events you've been experiencing! I'm so happy that There Was an Old Woman is getting the recognition it deserves. Audio book? New York Times Best Seller List? Slam dunk!!!! And, I have the feeling that the rest of 2015 is going to follow that path. Night Night, Sleep Tight already feels like a winner. The cover is brilliant, and sometimes, you can judge a book by its cover. So, I hope you will spend the day celebrating by doing whatever makes you smile. Thanks for sharing this fantastic news with us. I raise my imaginary glass to you in a toast of praise. Fabulous news for a fabulous writer! You so deserve all this! Shout it from the rooftops! I suspect 2015 is going to be an incredible year for you. Congratulations on all counts! Selfishly, I am particularly happy about the audiobook, as I read about four or five books a month in that format. My day job involves a lot of driving, so I ALWAYS have one in my car. It is delightful to know that this title I have not yet enjoyed is now available in that format. Good on you! Promote away. . .
Well deserved,Hallie! I'm so happy for you! Way to go, Hallie! I loved that book. Congrats! C*O*N*G*R*A*T*U*L*A*T*I*O*N*S, dear Hallie--this is wonderful news and there's no way you DON'T share it!! This is so exciting! Congratulations! So glad you shared so we can celebrate with you! Yay for you! How wonderful. Congratulations! Hurrah for happy surprises! . . . and a well-read audiobook is a special pleasure. Not blatant, just sharing, and putting a smile on another's face is most welcome. I am so very glad that it is finally out in audiobook. I have fallen hard for that addiction and have been waiting a long time for this one!